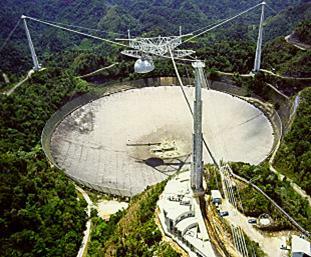 The Arecibo Observatory is a very sensitive radio telescope located approximately 9 miles (14 km) south-southwest from the city of Arecibo in Puerto Rico. It is operated by Cornell University under cooperative agreement with the National Science Foundation. The observatory works as the National Astronomy and Ionosphere Center (NAIC) although both names are officially used to refer to it. NAIC more properly refers to the organization that runs both the observatory and associated offices at Cornell University. The telescope is visually distinctive and has been used in the filming of notable motion picture and television productions: as the villain's antenna in the James Bond movie GoldenEye, as itself in the film Contact and in The X-Files episode "Little Green Men". The telescope received additional international recognition in 1999 when it began to collect data for the SETI@home project.